Place the rice in a bowl and cover with hot water. Roughly crumble a piece of true cinnamon into the rice mix (cassia will not let you break it…) and let is all sit and rest anywhere from 2 to 8 hours outside of the refrigerator. Place half of the rice mixture in the blender with half of the milk and vanilla and blend until smooth, then strain into a pitcher or container (if using cassia cinnamon, remove it). Place the other half of the rice mixture in the blender with the remaining milk and the sugar, pure until smooth and strain into the same pitcher or container. Stir well and serve over ice cubes, or place in the refrigerator until it is cold. Serve with more ice cubes to your liking, and sprinkle some ground cinnamon on top if you wish. Delicious! We made it with unsweetened almond milk and monk fruit sweetener which made it a little too sweet. We added 2 additional cups of almond milk and it was perfect! So wonderful that we were able to make our own horchata and avoid all of the extra ingredients in the mixed packets! Thanks! I’m so glad you made the recipe your own, Emmy! 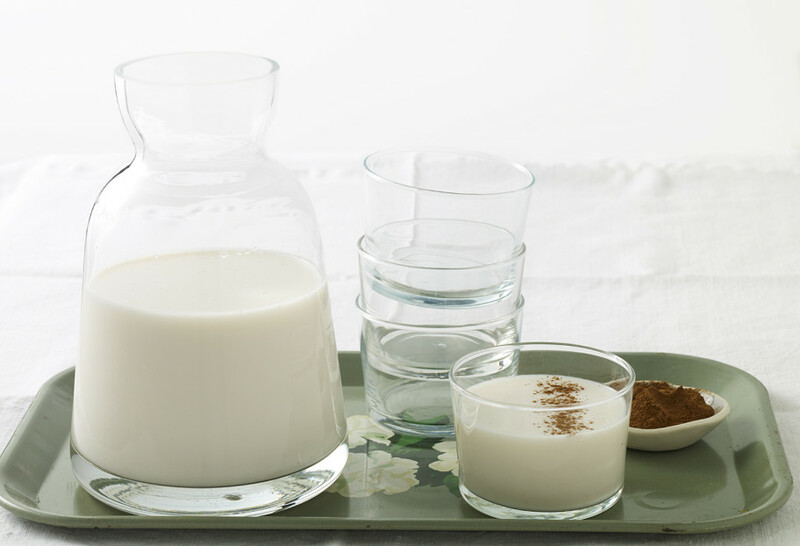 I’m going to try Pati’s recipe for my first time making horchata. I can’t wait. Do you blend the water w/ the rice? Or remove tge rice from water? Yes you blend the water with the rice…and I like to use a fine sieve. Really sweet. More milky than others I have tasted. But it is very good! So glad you liked it Spencer. Thanks Pati for the so very tasty recipe. We love all of your recipes, we’ve tried. We never make any changes! We love your show and it was so pleasant running into you at the Silver Spring street market the other year. Such an inspiration!! It was so nice running into you too! I hope you continue to enjoy all of the new recipes! I recently started watching your cooking program along with my five year old daughter who loves to be in the kitchen and help with whatever she can get her little hands on. She absolutely loves to watch you cook and cannot wait for us to make horchata and your tres leches cake! Which vanilla extract do you highly recommend to use? I hope you and your daughter have so much fun in the kitchen! I look for a vanilla that’s from Mexico, preferably from Papantla or Veracruz. And make sure to get the real extract, that says “pure vanilla extract”, not an imitation flavor. Pati se tiene que lavar el arroz hasta que quede la agua clara como cuando se cocina antes de cubrirlo con la agua caliente? Gracias! Hello sweet lady its been awhile since we last chatted through e-mail over five years go am still enjoying and watching your show. My son asked since its been hot over here in Arizona if i could please make him some Horchata, i said of course since we Latina mothers love feeding our sons LOL! Thank you for this recipe i will make it this weekend to go with pollo asado kabobs and corn on the cob. So wonderful to hear from you Stella! I hope you and your son love the Horchata. Yay! Hope your family loves it Ana. Could I use almond milk instead of cow’s milk? Yes Susan you can! It will also be delicious. This is so go and refreshing!